The development of various industries has had many positive and negative impacts. With the advancement of technology and increase of various industries, wastewater from these industries is a serious threat to the environment. Factories and industrial units according to their activity daily a large amount of industrial health and wastewater impose into the environment. 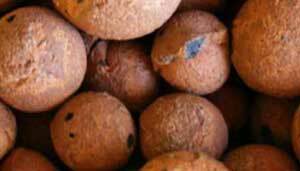 Expanded Clay Aggregate (ECA) or Lightweight Expanded Clay Aggregate (LECA) due to its physical and chemical properties; it can increase the process of adsorption and ion exchange. It is a lightweight mineral aggregate containing components relative to phosphorus adsorption (calcium, iron, manganese, aluminum). Expanded Clay Aggregate (ECA) or Lightweight Expanded Clay Aggregate (LECA) are described that are prepared by expanding and firing a clay-based material, and where the finished aggregates have a diameter of up to about 32 mm, for use as filtration medium for purifying water, wherein carbonates of calcium and/or magnesium are added to the clay as flux material prior to expansion and firing. Uses of the expanded clay aggregates (ECA) for removing phosphorous by utilising die clay aggregates are also described, as well as a method for removing phosphorus by using the clay aggregates.